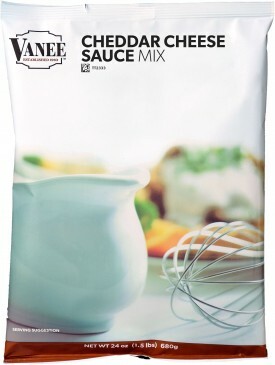 Vanee Cheddar Cheese Sauce Mix combines great, authentic cheese flavor and texture along with superior handling and performance. 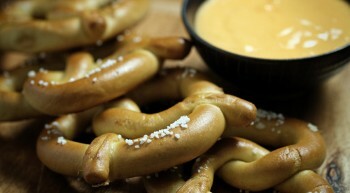 Great for nachos, fries, mac & cheese, hot dogs, and veggies. Vanee Cheddar Cheese Sauce Mix is an easy and affordable way to make large volumes of rich, creamy, best-in-class cheese sauce. Each 24 oz. bag makes 76 quarter-cup servings (prepared), for a total of 456 servings per case. Use to make macaroni & cheese, serve over nachos, french fries. Gradually add one bag of gravy mix to a gallon of warm water while whisking. Bring to a boil, stirring frequently. Reduce heat and simmer 3-5 minutes, stirring briskly until thickened. Shortening Powder (Coconut Oil, Corn Syrup Solids, Sodium Caseinate, Mono & Diglycerides), Food Starch - Modified, Cheese Flavor (Cheddar Cheese [Pasteurized Milk, Cheese Culture, Salt, Enzymes], Whey, Buttermilk Solids, Salt, Sodium Phosphate, Lactic Acid), Dried Sweet Whey, Maltodextrin, Salt, Palm and Soybean Oil, Soybean Oil, Flavor (Yeast Extract, Whey, Cornstarch, Natural Flavoring, Yeast, Food Starch-Modified, Maltodextrin), Xanthan Gum, Yeast Extract, Sugar, Disodium Inosinate, Disodium Guanylate, Yellow # 6, Yellow # 5, Coconut Oil.